Can I place the Receiver on another collar? Yes. You may use any 1-inch, non-metallic collar. Can I use more than one Receiver Collar with the Wireless Mapping Fence? Yes. There is no limit to the number of pets you can contain with the Wireless Mapping Fence. You must purchase an additional Receiver Collar for each pet. Can I use the Wireless Mapping Fence on a cat? The Wireless Mapping Fence can be used as long as the cat can comfortably wear the Receiver Collar and is 15 pounds or more. Do I need to perform maintenance on my Wireless Mapping Fence? Check the Contact Points on the Receiver Collar weekly to make sure they are clean. 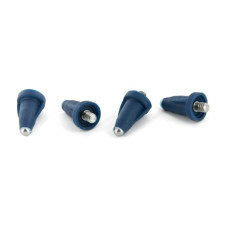 The Contact Points are designed to be hand tightened. Do not over tighten. The Receiver Indicator Light acts as a Battery Status Indicator, flashing red every 4 to 5 seconds when battery charging is required. How do I know if the battery in the Receiver Collar is charged? Check Battery Status Indicator Lights. Light will flash green or red/green or red indicating the charge status of the battery. Each charge can last up to 9 days depending upon frequency of use. The Receiver Indicator Light acts as a low battery indicator, flashing red every 4 to 5 seconds when battery charging is required. The tone only mode can be used in training your pet to his boundary or for well-trained pets who no longer require Static Correction. Will a sloping yard or hills affect the Pet Area? No. The Transmitter signal extends up to 90 feet in all directions. A sloping yard or a yard with hills can cause the Pet Area to appear less or more than expected. Consider repositioning the Transmitter to maximize your Pet Area. Reminder: By moving your Transmitter you will need to reprogram your Boundary. Will vehicles, buildings, and landscape features (trees, shrubs, etc.) affect the performance of the Wireless Mapping Fence? Yes. Placing the Transmitter inside a metal building can reduce the maximum range of the Wireless Mapping Fence. Parking a vehicle near the boundary, can reduce the range in that area and cause your pet to receive a Static Correction where it otherwise would not if the vehicle was not there. 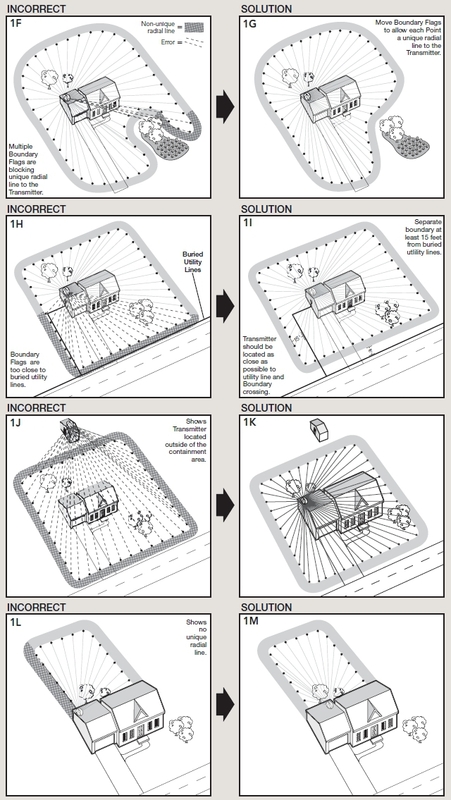 Fixed large metal objects such as metal sheds can affect the signal by reducing the maximum range of the system at the location of the object. How long does it take to charge the collar battery? The receiver collar will fully charge in 2-3 hours. Each charge can last about 9 days, depending on how often you use it. The collar light will blink red every 4-5 seconds when it needs to be recharged. In this video we show you how to setup, install, and train your dog on your new Wireless Mapping Fence. The maximum number of Boundary Flags the system can accept to program is 128. The Transmitter must be mounted because any slight change to the position would change the boundary. Prior to mounting the Transmitter, place and test the Transmitter on cardboard boxes or on a non-metallic shelf. Be sure to position the Transmitter so you can read the PetSafe® logo straight on and not sideways. If there is a pre-existing In-Ground containment system, the perimeter wire MUST be totally disconnected from its Fence Transmitter. It's not necessary to remove the wire from the ground. We recommend using Google Earth as a tool to help sketch the layout. Completely encircles the house. The Transmitter is inside the house. Does not completely encircle the Transmitter. 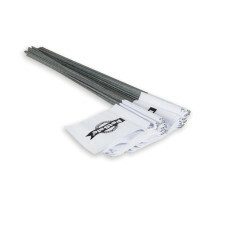 Has starting and ending flags located at house corners or up against an outside wall or fence. Requires a minimum of 10 programmed boundary flags. You want to limit the containment area to a smaller portion of the yard, such as the back yard or front yard. You need to avoid running your boundary parallel with buried utilities. 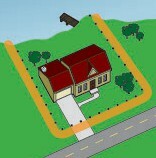 Your house is so large that it cannot be completely encircled with a full boundary covering the 90 foot maximum range. Each flag must have a unique radial line to the Fence Transmitter and cannot cross over another flag or block another flag. Give your pet full access to the yard with this layout. Requires at least 40 programmed Boundary Flags. Limit your pet to the back or front yard only. Requires at least 10 programmed Boundary Flags. With partially fenced yards, you can give your pet access to the whole yard or only the parts you'd like. This is also a good option to stop pets who try to jump over or dig under the fence. Give your pet access to the yard and dock on a waterfront property. Don't want him jumping in the water? Set the boundaries on the shore. And don't forget to remove the collar when you hop in the boat for a spin around the lake! Each boundary flag placement must be located between 15 feet and 90 feet from the Transmitter. Each boundary flag must have a unique radial line to the Transmitter and cannot cross over another flag or block another flag. 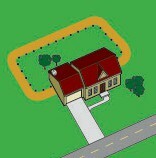 When implementing a partial boundary, the first and last boundary flags must be located within 1 foot of the physical boundary, for example the house, fence, outside wall, etc. Any buried utility line such as power, CATV, phone or metal water line must not run parallel with the boundary unless separated from the boundary by at least 15 feet (1I). Because they are not buried as deeply, CATV or phone lines usually cause more problems than power and water lines. This may require using a partial boundary to avoid this problem. Always avoid crossing buried utility lines at points far away from the Transmitter. If it is required for the boundary to cross a buried utility line, it should cross at approximately a right angle, and it is preferable that the crossing be as close to the Transmitter as possible, but not closer than the 15 foot minimum. Do not place the Transmitter on top of any metal surface such as a refrigerator, metal shelf, or metal table. Do not mount the Transmitter within 5 feet of large metal surfaces such as refrigerators, washer/dryers, metal tables or shelving. Do not locate the Transmitter closer than 10 feet from water heaters and furnaces. The Transmitter should not back up to a mirror on the other side of a wall. There needs to be more than 1 foot of separation between the Transmitter and the mirror. Do not mount the Transmitter within 2 feet of a concrete floor or adjacent to metal HVAC ductwork. If placing the Transmitter in the garage, mount Transmitter near the ceiling and at least 2 feet above roof of any vehicle parked in the area. If the Transmitter is within 10 feet of a metal overhead garage door, it needs to be placed above the top of the door, close to the ceiling. Do not mount the Transmitter near electrical service panel or near main wiring trunks due to the large concentration of house wiring. Transmitters may be located in basements as long as installation requirements are observed. For a partial boundary, locate the Transmitter at least 10 feet away from the entry door where your dog will exit home and enter the containment area. If a successful boundary is not obtained with the first choice Transmitter location, try a second or third location. If a trial location proves to provide a successful boundary, then the Transmitter can be more permanently secured prior to programming a more exact final boundary. Turn ON Transmitter in temporary location. Use Test Mode to do Boundary Flag Test and Boundary Scan. Ensure arrow on Receiver Mounting Bracket is pointing away from transmitter. Test to ensure flags are within 15-90 feet from transmitter. Go into Boundary Scan Mode on BPU. Walk entire boundary with arrow pointing the direction you are walking. Test each corner flag. Listen for a change in tones and read the BPU screen. If the flag is not in an acceptable location, the BPU will display a message indicating why the location failed. 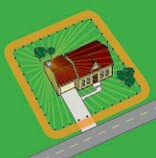 A Boundary Scan is used to check for buried wires or possible interference that may require you to move your boundary or transmitter location. From the BPU main menu, select Test Mode I Boundary Scan Mode. Starting at Flag 1, walk the entire boundary in a CLOCKWISE direction around the Fence Transmitter. Keep with the arrow pointing in the direction that you are walking. listen for a change in tones from a steady tone to a more rapid tone as you walk the boundary. The BPU will indicate good or bad locations as you walk. Scanned areas with number readings of 0 to 3 for more than 10 feet should be avoided. You could experience interference in these locations. Either adjust your boundary or consider moving the Fence Transmitter. If a successful boundary is not obtained with the first choice location, try a second or third location. If a trial location proves to provide a successful boundary, then the Fence Transmitter can be more permanently secured prior to programming a more exact final boundary. If the Boundary Scan is successful, you may proceed with Programming your boundary. Number the flags with a permanent marker to assist in keeping track of the flag numbers when programming the boundary. Place the flags along the boundary. The numbering should increase as you move in a CLOCKWISE direction around the Transmitter. The first flag should be at the start of a partial boundary or can be anywhere on a full boundary. Remember, each flag must have an uninterrupted radial line to the Fence Transmitter. Before mounting the Fence Transmitter, make sure that you review the Installation Requirements below. It is important that the Fence Transmitter is not moved once mounted as even slight changes may cause disruptions to the established boundaries. To ensure proper operation, this Transmitter must be permanently mounted on a vertical, non-metallic surface using the mounting bracket provided. Do not place the Fence Transmitter on top of any metal surface such as a refrigerator, metal shelf, or metal table. Do not mount the Fence Transmitter within 5 feet of large metal surfaces such as refrigerators, washer/dryers, metal tables, or shelving. Do not locate the Fence Transmitter closer than 10 feet from water heaters and furnaces. The Fence Transmitter should not back up to a mirror on the other side of a wall. There needs to be more than 1 foot of separation between the Transmitter and the mirror. Do not mount the Fence Transmitter within 2 feet of a concrete floor or adjacent to metal HVAC ductwork. If placing the Fence Transmitter in the garage, mount the transmitter near the ceiling and at least 2 feet above roof of any vehicle parked in the area, If the Fence Transmitter is within 10 feet of a metal overhead garage door, it needs to be placed above the top of the door, close to the ceiling. Do not mount the Fence Transmitter near electrical service panel or near main wiring trunks due to the large concentration of house wiring. Fence Transmitters may be located in basements as long as installation requirements are observed. For a partial boundary, locate the Fence Transmitter at least 10 feet away from the entry door where your dog will exit home and enter the pet area. If the transmitter will be mounted in a high traffic area, mount it high enough on the wall so that you can walk underneath it. Remove mounting bracket from the Transmitter. Using the screws and mounting anchors provided, mount the bracket to the wall. Slide the Transmitter over the bracket Be certain that you can read the PetSafe® logo straight on and not sideways. Plug the adapter into a functional AC wall outlet The power light on the power adapter should turn GREEN. Slide the power switch UP to turn ON the Transmitter. After successfully conducting boundary tests and installing the Fence Transmitter, you are ready to program the boundary into the Receiver Collar. As a reminder the maximum number of flags is 128. With the Receiver Collar connected to the Boundary Programming Unit (BPU) as in test mode, turn ON the BPU. Select the boundary type, Full or Partial. Starting at Flag 1, walk in a CLOCKWISE direction around the Fence Transmitter. Be sure to point the arrow on the Receiver Mounting Bracket in a direction away from the Transmitter when programming each flag. Stop at each flag to acquire boundary data by following the prompts. Be sure not to move the Receiver Collar while recording the boundary data. As in the TEST MODE, the range will be displayed if the flag is accepted. Otherwise, an error menu will indicate what caused the location to fail. After all flag positions have been recorded, the BPU will prompt you to record a Reference Point location. The Reference Point is a location that can easily be remembered and is permanent (i.e. a comer of a sidewalk or driveway). The Reference Point must be located 20 to 80 feet from the Transmitter. This Reference Point location is used to add multiple receivers to the system. Once you’ve collected the Reference Point press OK on the BPU to initiate the Boundary Calculation/Receiver Programming processes. Together, these processes may take several minutes to complete. During this time, you may leave the area, but do not unplug the BPU from the Receiver Collar until you see the message on the BPU screen giving you permission to disconnect. After programming is complete, disconnect the BPU from the Receiver Collar and turn off the BPU. 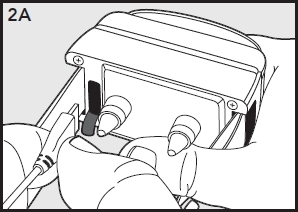 When disconnecting the BPU, the Receiver Collar will beep twice and power down. Charge the additional Receiver Collars. Attach the new Receiver Collar to the Receiver Mounting Bracket and Receiver Handle. Turn ON the BPU and plug the BPU cable into the Receiver Collar. Walk to your Reference Point in your yard. The arrow on the Receiver Collar mounting bracket must be pointing AWAY from the Transmitter. Move the BPU cursor to the ADD-A-DOG position, press OK, and follow the BPU directions. Once you receive the message that programming is complete, disconnect the Receiver Collar, turn OFF the BPU and verify that the Receiver Collar is operating properly with the Warning Zone and Static Correction Areas. Once you program a second boundary, the previous boundary will no longer remain in the Boundary Programming Unit, but the previously programmed collars will retain the initial boundary. If you want to retain both boundaries, contact the Customer Care Center to purchase an additional Boundary Programming Unit. You will not be able to move the Transmitter as this will affect the set-up for the previously programmed collars. Follow all of the same programming guidelines as the previously programmed collars. The Boundary MUST go CLOCKWISE. The Arrow on the Receiver Collar mounting bracket must point AWAY from the Transmitter, the PetSafe logo MUST face the dog’s chin. If you have multiple boundaries, you must be able to identify which pet should be wearing the appropriate Receiver Collar for their intended boundary. Call our Customer Care Center for information on different colored collar straps. This feature is used to program the Receiver Collar to operate on the same frequency selected for the Transmitter. The Wireless Mapping Fence is capable of operating on two different frequencies (A or B). This feature is useful when two containment systems are operating in close proximity to one another. The Wireless Mapping Fence will not function properly if you and your neighbor have the Wireless Mapping Fence operating on the same frequency and the two Transmitters are located within 120 feet of each other. The default factory setting for Mapping Fence is frequency A. Two operations are required to switch the Fence system to a different frequency. First use the System Settings > Transmitter Settings mode on the BPU to select frequency A or B. This programs the desired frequency into the Receiver Collar. Next, the Transmitter must be switched to the same frequency as chosen for the Receiver Collar. This is done via a frequency select switch on the rear of the Transmitter housing, accessed through a panel labeled Mode Selection Switch. Always double check to verify the Receiver Collar and Transmitter are set to the same frequency. 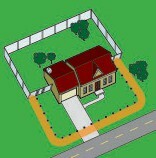 Note that your boundary must be re programmed if the Wireless Mapping Fence frequency is changed. Display Version, Program Version, Receiver Version, and Error Log are used to access the operating software versions that are programmed into the BPU and Receiver Collar and the Error Log. These features are intended to be used when contacting Customer Care to assist in troubleshooting certain problems that might occur. This feature is used to restore all of the user selectable settings back to the factory default settings. The dog will hear a two second warning tone when he reaches the Warning Zone. If the dog does not return to the Pet Area after two seconds, he will receive a continuous Static Correction until he returns to the Pet Area. Once the Static Correction has started, the dog must remain in the Pet Area for at least 10 seconds to reset the Warning Tone output. If he re-enters the Warning Zone prior to the 10 second reset period, he will automatically receive the Anti-Linger Correction upon entering the Warning Zone. The Receiver Collar automatically increases the Static Correction when the dog continues beyond the Boundary Flag Programmed points. If the pet leaves the Pet Area, this feature limits the Static Correction duration to 15 seconds. While the system locks out further Static Correction, the green light will remain on for 10 seconds. If your pet returns to the Pet Area, he will not receive a Static Correction upon return to the Pet Area. When you remove the Receiver Collar from the Charger, the Receiver’s internal diagnostics will check that the battery charge is full and that all circuits are working correctly. Used to program the Static Correction Level into the Receiver Collar. Used to program the distance between the Warning Zone and the Static Correction Area. You can select three distances, Min. Average, and Max. These distances correspond to 1 foot, 3 foot and 5 foot respectively. The default setting is the Average warning zone width. This feature is used in conjunction with a partial boundary. Enabling this feature protects your dog from wandering away from the unprogrammed portion of the boundary. For example, if you have a partial boundary in your back yard and the dog escapes out your front door, the Receiver Collar will generate a Static Correction when the dog reaches the maximum Transmitter range if this feature is enabled. The maximum Fence Transmitter range that the Receiver will generate a Static Correction is approximately 110 feet. The default setting is YES which enables this feature. Enable Sleep Mode to extend battery life. This feature is used to program whether the Receiver Collar is allowed to go into a Sleep Mode to conserve battery life when your dog is not moving. For the Receiver Collar to go into the Sleep Mode the Receiver Collar location must be at least 20 feet away from the programmed boundary, at least 12 feet away from the Transmitter, and must have remained in the same location (i.e. not more than 6 inches of movement) for at least 15 seconds. Under typical conditions the battery life with sleep mode enabled should be 10 to 14 days depending upon frequency of dog’s sleeping habit when wearing the collar. With the Sleep Mode disabled, the battery life is reduced to approximately 3 to 9 days. The default setting is YES which enables this feature. Used to determine the charge status of the receiver battery. Before starting to program a boundary, make sure that the Receiver Collar is fully charged. Used to verify that a valid boundary has been programmed into the Receiver Collar. The Receiver Collar activates when it loses the Transmitter signal. The metal crate may block the Transmitter signal which causes the Receiver Collar to activate. Remove the Receiver Collar from your pet before placing him in his metal crate. The Receiver Collar activates in the middle of the yard. The Receiver Collar activates when it loses the Transmitter signal. This sometimes occurs if a large metal object is between the Receiver Collar and Transmitter, if the orientation of the Receiver Collar changes near the Warning Zone, or if the surrounding “electronic noise” interferes with the signal. If this continues to occur, consider relocating the Transmitter and resetting the Pet Area. Connect the BPU to the Receiver Collar and use the Scan Mode to test the areas of the yard where the Receiver Collar is activating. There may be something underground that may be causing the Transmitter signal to be distorted in that area. The Receiver Collar is beeping but my pet is not responding to the Static Correction. Make sure the Static Correction Level is set at 2 or above. Test the Receiver Collar with the Test Light. Trim your pet’s fur where the Contact Points touch the neck and/or switch to the longer Contact Points. Contact Points must be in contact with dog’s skin. Remove the Receiver Collar from your pet when indoors to avoid activation of the Receiver Collar. The Receiver Collar is not beeping when setting up the Warning Zone. The beep may be difficult to hear in a noisy environment. Use Test Light as explained in the “Test Light Instructions” section, and use it to determine the location of Warning Zone. The Transmitter Power Light is not on. Make sure the Power Light on the Power Adapter is on when plugged into a working AC power wall outlet. Make sure the Transmitter Power Switch is turned on. If Power Adapter Light is not on, contact the Customer Care Center for a replacement Power Adapter. The Warning Zone seems to fluctuate. This is normal for the electromagnetic field of the Wireless Mapping Fence. The field may be affected by surrounding “electronic noise,” which can cause it to fluctuate up to 5%. Where the Receiver Collar activates is influenced by the speed and orientation of the Receiver Collar as your pet enters the Warning Zone.